The 2018 workshop program was based on a general call-out to the community. We are delighted that 20 individuals rose to this call and presented a fantastic program attended by over a hundred people. Our closing event, which was a film screening of Angry Inuk, was attended by 57 people including many Indigenous Education teachers in Niagara who were new to this important local, social justice issue. It is so exciting that our local educational initiatives are spreading outside of our community. People from across the country are engaging and learning about the issues at Short Hills and about Indigenous-settler partnerships in responding to those opposing Indigenous Rights. We have received a fantastic amount of corporate and organizational support, including letters of solidarity which are posted on our website. Most noteworthy are statements of support from Brock Students for Animal Liberation and from Halton Hamilton Animal Liberation Team https://sixnationsrighttohunt.com/support/. It is wonderful to see the ways that folks in the animal movement are working to decolonize animal liberation. We continue to be grateful for the support of Christian Peacemaker Teams (CPT), an international human rights organization which builds partnerships to transform violence and oppression across the globe. 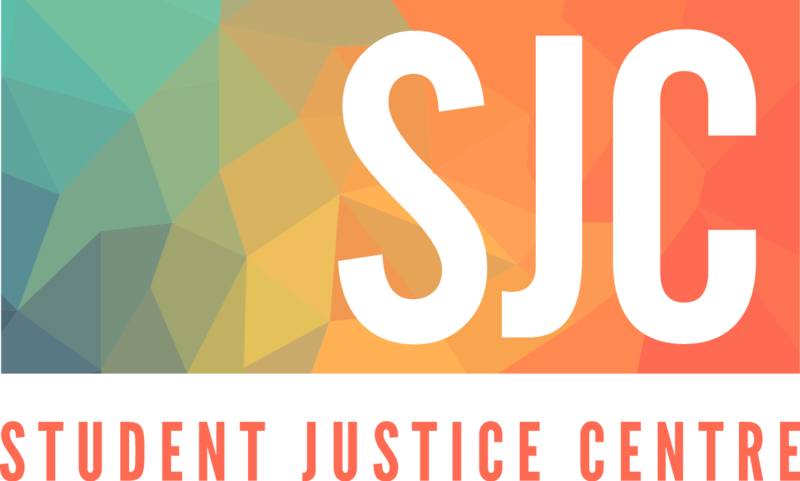 CPT seeks to enlist faith groups, settlers, and other non-Indigenous groups in the work of Indigenous solidarity. Their presence at Short Hills, and participation in our workshops, links our work with resistance and solidarity work around the world. On November 27, 2018 we presented a petition with over 1,500 signatures to the Niagara Regional Police Services Board. Our goal is the total and complete end to any stalls of Haudenosaunee harvesters as they enter and exit Short Hills Provincial Park. We acknowledge the right to protest but that right does not extend to the harassment and stalls that the harvesters of the Haudenosaunee Wildlife and Habitat Authority have endured since the beginning of the Short Hills deer harvest in 2013. 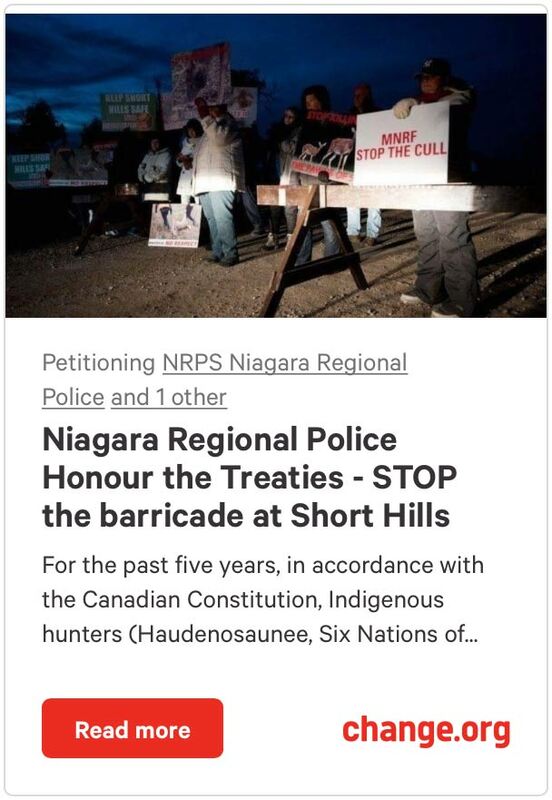 We are not proud to live in the only region where an illegal anti-hunt settler protest against the Haudenosaunee takes place! However, we are very proud of the ways that Indigenous- settler alliances have been formed to respond to this colonial act of violence. We hope that in the future the Haudenosaunee Wildlife and Habitat Authority can carry out their harvest at Short Hills without settler disruption. We are pleased to report that each year, fewer and fewer protesters come to the park to block harvesters from directly entering and exiting the park. This too is an accomplishment! We continue to believe that education and peace work is the way forward toward peaceful resolution. We invite you to attend one of our upcoming workshops. The City of St.Catharines hosted the Supporters of Haudenosaunee Right to Hunt at the First Ontario Performing Arts Centre on Friday Jan 11th 2019. Our panel discussion opened the reception to the exhibition of works by contemporary Indigenous Artist, Carl Beam. We also offer workshops at Brock University hosted by OPIRG on Monday Feb 4th from 1-2pm, Wednesday Feb 13 from 2-3pm, Wednesday Mar 6 from 2-3pm and Thursday Mar 14 from 1-2pm. Thank-you again for your important support. Through financial and in-kind donations, we were also able to have food for the peace food table, firewood for the social fire, as well as a canopy for the rain. None of this would be possible without the donations of time, energy, food and finances from Niagara community members such as yourselves! If you have any questions, do not hesitate to contact us at sixnationsrighttohunt@gmail.com.